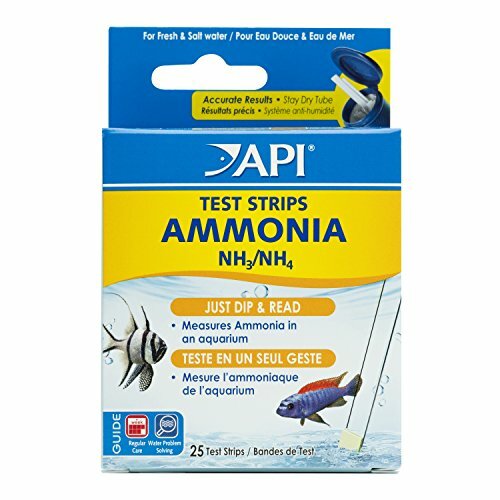 Quickly and easily check your aquarium's ammonia levels with API AMMONIA TEST STRIPS. Fish continually release ammonia into the aquarium through their gills, urine and solid waste. Uneaten food and decaying organic matter also add ammonia to the water. Ammonia is toxic to fish and can cause gill damage, stress and death. Regular testing is recommended because ammonia levels can build quickly due to fish waste and uneaten food. Simply dip the test strip into the water, then compare the results with the precise, easy-to-read color-coded chart to determine if any action should be taken. The chart includes recommendations on how to treat the water and neutralize ammonia. Safe for use in fresh and salt water. With API Aquarium products, it’s easy to keep a beautiful saltwater, freshwater or reef aquarium. For over 50 years, API has been creating innovative, research-driven solutions that make it easier to care for your fish and aquarium. API Aquarium Treatment Supplies are designed to work in conjunction with each other to provide best results to control algae, promote healthy bacterial growth and help control and cure fish diseases and conditions such as ich and fin rot. They work to provide a safe, hospitable environment for fish such as tropical community fish, cichlids, goldfish and more. With API, you can spend more time admiring your fish, and less time scrubbing your tank. Make sure to use all products as directed in order to ensure the best results.